There is so much to love about this planet. For one, it's a planet filled with many species, who co-exist in harmony. It is usually on farms that you will find many of these majestic and somewhat adorable mammals, as the famous song goes: "Old MacDonald had a farm..."
For centuries we have existed alongside farm animals, such as pigs, cows, horses and sheep, interacting with them for a multitude of reasons, from agriculture to entertainment and even therapy. Toy makers, CollectA agree with these sentiments, which is why it has created a collection of miniature scaled replicas to pay homage to Farm Animals. 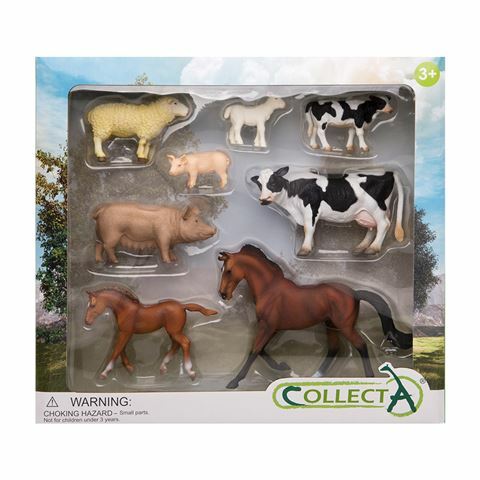 Made from durable plastic, CollectA’s Farm Life Set is the perfect addition to your shelf or desk. The set of eight scale replicas include a Friesian Cow, Friesian Calf, Sow, Piglet, Lamb, Bay Thoroughbred Mare and its Bay Foal, each featuring realistic details such as tails, hooves, muscle details and even white markings, to give children and adults, alike, a realistic representation of these amazing animals. Miniature scale replicas of 8 different farm animals. Realistic features and painted details, including tails, manes, hooves and markings. Presented in a CollectA gift box.